Just a note for one more milestone in my diving journey, month ago being on my 5th year in diving I earned 100 hours underwater. 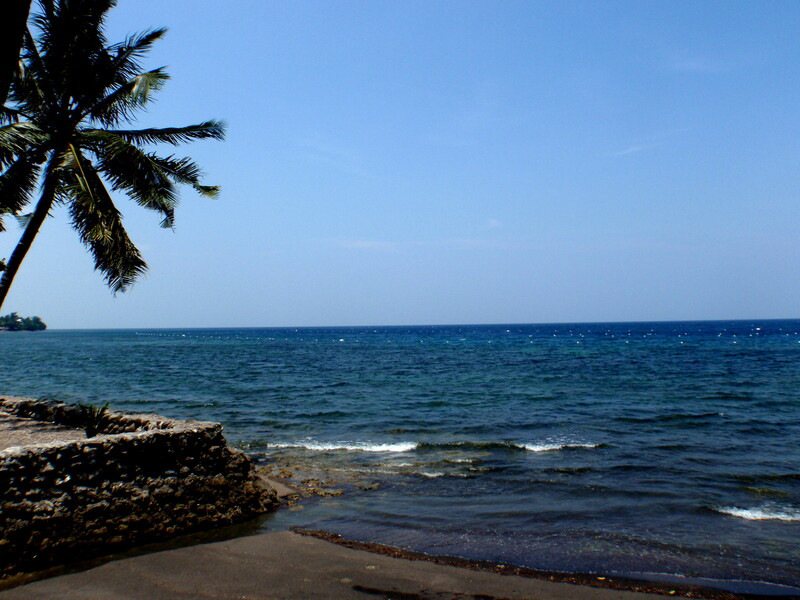 It was on my 123rd dive, not on a fancy dive resort wallowing in luxurious amenities but on Linamon coast in Iligan Bay. 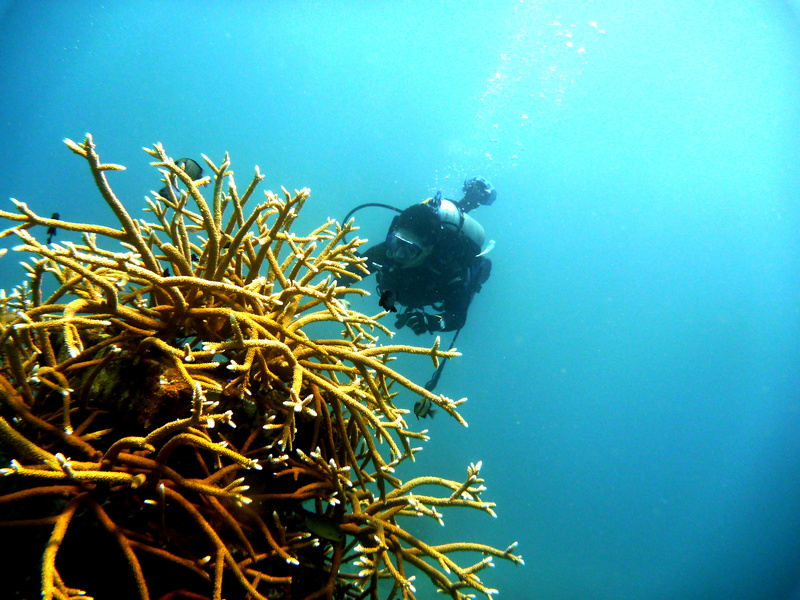 It was an exploration dive on a sunny Sunday with blue skies, just perfect for an underwater venture. After some works in the fish sanctuary, the Linamon project work force suggested for a break and went with me. Although the west end of the fish sanctuary was not a usual site, we were not disappointed. 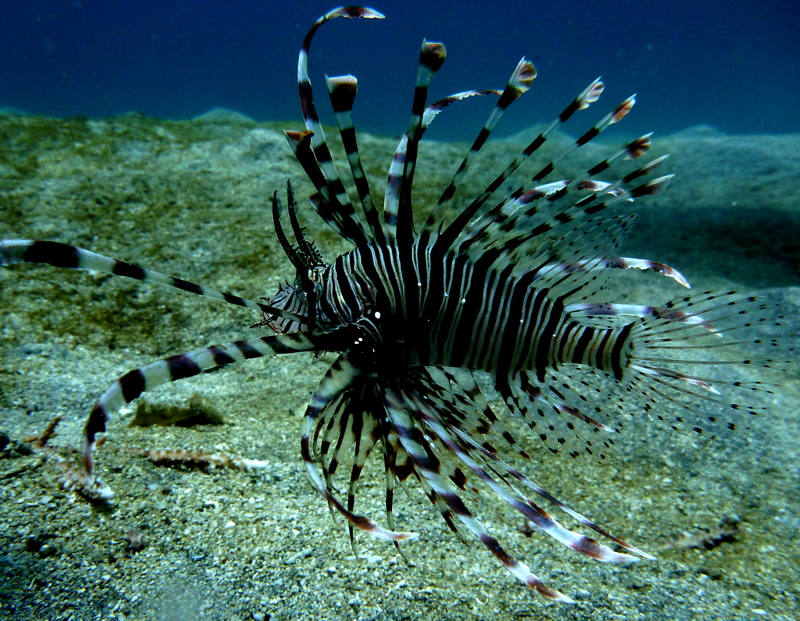 The depths was blessed with biodiversity. There was variety of corals, sponges, invertebrates, crinoids, hydroids and fish species. We found nudis, juveniles and even crown of thorns. The visibility was good although there was kind of murky area, we didn’t find trash underwater. I was impressed that residents in the coastal area have managed well their waste disposal. It just occurred to me that LGU Linamon was an awardee on War on Waste movement few years back. Looking back, all my 100 hours were pure joy and very enriching – treasures indeed worth reminiscing. I have lost track in my dive log. I dive and dive with spontaneity, record my descents without counting the hours. It was just coincidence that we ended with a sumptuous lunch at Grande Brasille Resto nearby. I shared laughter and stories with Che, Sam, JR, Alvin Jay and Jong before going home. It was still a celebration altogether! Magoong and Samburon Fisherman Association (MASAFA) is a group of fisherfolk in the two coastal barangays of Linamon,Lanao del Norte taking responsibility in the management of the established marine protected area (MPA) of LGU Linamon. Community-based projects is a strategy found to be effective in marine protection and preservation among coastal areas. The group actively participated in the coral transplantation project that aimed to preserved and enhance the coral reefs in the area. The six-hectare MPA is under the responsibility of MASAFA committing to protect its surrounding waters. They are patrolling the the area to prevent unwanted intruders disturbing the waters which includes beach goers. As recipient of NRM project, the group was provided assistance in terms of income generating activities as alternative source of livelihood for the fisherfolk. A start-up capital of PhP 250,000.00 for their proposed bangus production through fish cages which they will managed to improve their capacity and capability to implement economic activities for the community. As on-ground investments to support for their livelihood and improve their incomes. MASAFA is just one of the rural communities that receive funding and technical support to pursue the objectives of the Mindanao Rural Development Program 2 in pump-priming Mindanao’s rural economy. The greatest possession a fisherfolk in a coastal community must have, is a small boat. Just a small boat that he can ride on as he goes fishing in nearby waters for a day’s need. Nothing can be more important than his small boat. In few days, we will commence our work in the Linamon coral transplantation, just few more days. We have waited for so long, but now we will finally do it. The trajectory given by World Bank mandated to complete the works not later than June 30. And it was a tall order. 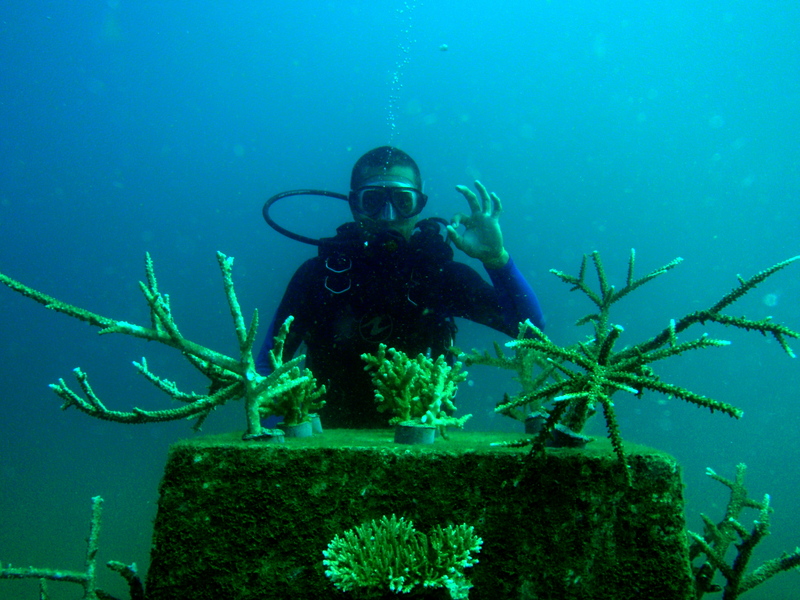 Now, I can only imagine the dives that have to be done to finish the remaining area of the one hectare coral nursery. For sure, it would be work unlimited underwater, for marine life preservation and protection in the area. The community is involved in this project and have fully participated since it all started, one of the best practices to ensure the sustainability of the marine protected area. 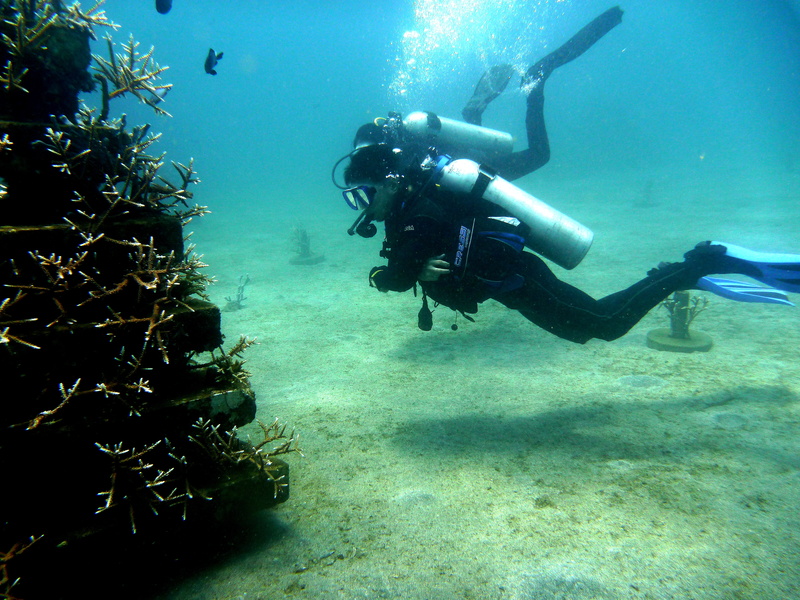 Finishing off the one hectare coral nursery is indeed a gargantuan task. It’s been almost twenty months since I last joined them in the evaluation of the first few substrates that were tested. Soon, I would be working in a different environment under different pressure. Breathing underwater in gears, carefully planting the materials in “pots” in silence. It’s pretty outlandish and not everybody has the opportunity to do this kind of work for the marine environment.